In this Caramelized Apple Tart recipe, the apples are baked into a shortbread tart shell with a brown butter custard. 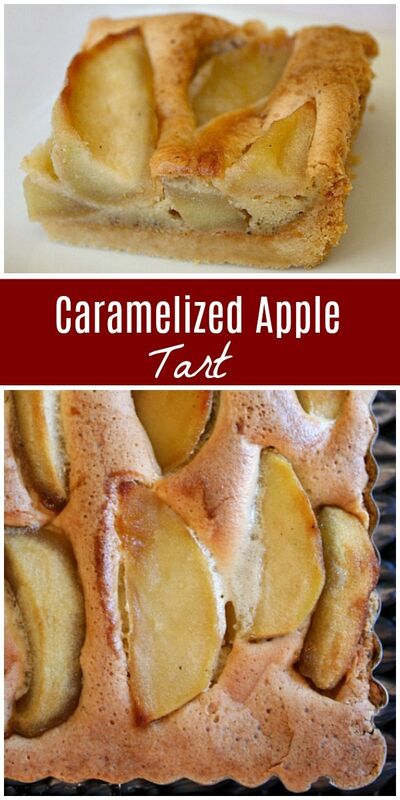 The result is a delicious fall pastry dessert. 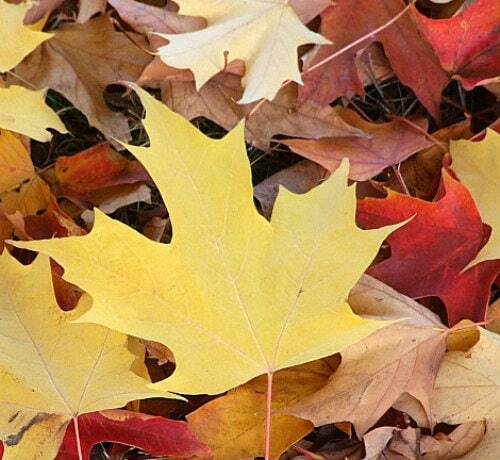 Autumn is an awe-inspiring, beautiful season in most parts of the US. Brightly-colored leaves cover the trees, and we begin to see hints of crimson, yellow and orange dotting the landscape as winds clear the branches bare. Apples of all kinds are begging to be plucked from their trees, and they’re plentiful and affordable in the markets too. It’s the time of year when I begin to dream up recipes that will utilize all of those fabulous apples. I scour my archives and cookbooks for ideas, creating a pile of ‘must-make’ recipes that is much too ambitious for the season. 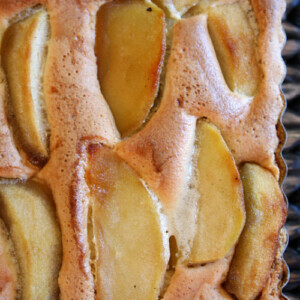 This Caramelized Apple Tart is one that was on the top of my pile this year! 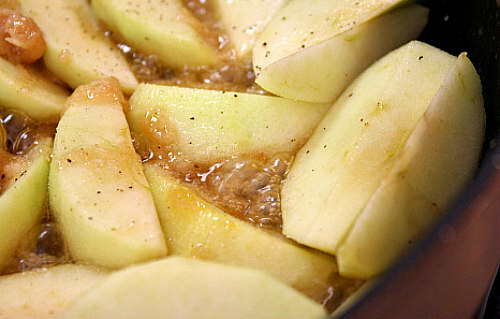 Crisp, Granny Smith apples are sauteed in bubbling butter and sugar until properly golden and covered in a drippy, caramelly syrup. These apples are a star in this Caramelized Apple Tart. For the custard, sugar and eggs are beaten until thick and fluffy… then flour, salt and nutty browned butter are blended in. 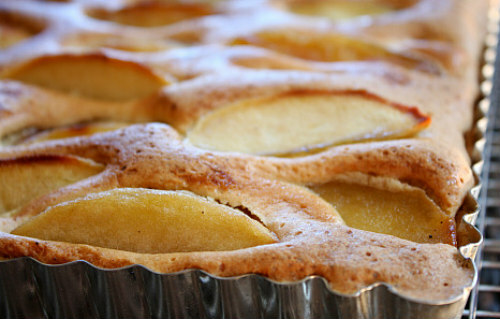 The custard is poured into an already baked tart shell, and the apples are placed on top in desired decorative fashion. Your apples are likely to sink into the custard when you arrange them on top of the custard, so plan to save a handful and place those into the tart after it has baked for about 15 minutes. At that point in baking, the custard will have firmed up slightly, and the apples can be easily placed into the tart and will stay visible in the final baked product. 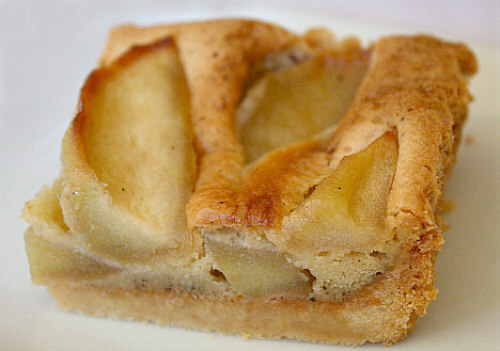 The tart crust is buttery and flaky. The custard wrapped itself around the caramelized apples and firms up when baked. A little freshly whipped cream spooned on top, and it is perfect. If you are looking for more recipes to make with apples, you might also enjoy my Cinnamon Apple Pie Cake or these Apple Fritters. Apple Cream Cheese Bundt Cake, Apple Streusel Bars, and Caramel Apple Bars are excellent apple-themed recipes too! In this Caramelized Apple Tart, the apples are baked into a brown butter custard. 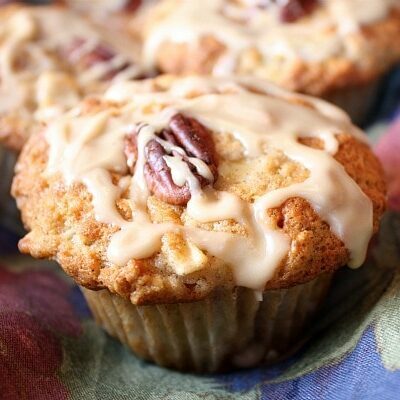 It's a fabulous fall dessert recipe! Preheat the oven to 350°F. 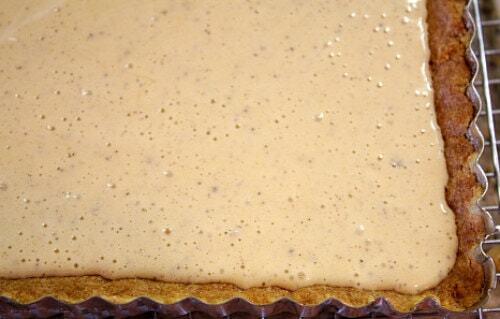 Spray an 11-inch fluted tart pan with a removable bottom with cooking spray (can also use 8x11-inch tart pan). 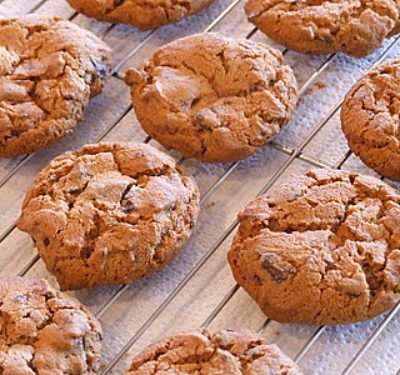 In a food processor, pulse the flour with the sugar, baking powder and salt. Add the butter and egg yolk mixture and process just until the pastry comes together. Remove the pastry dough to a lightly floured work surface and knead 2 or 3 times. Press the dough evenly into the pan and refrigerate until chilled, at least 30 minutes. Line the tart shell with parchment paper and fill loosely with pie weights (or beans). Bake for about 20 minutes, until the edge is set. Remove the parchment and weights and bake for 10 to 20 minutes longer, until the tart shell is lightly browned all over. While shell is baking, prepare the filling. In a large skillet, melt 2 tablespoons of the butter. Add 1/2 cup of the sugar; cook over high heat until lightly browned. Add the apples, season lightly with salt and pepper and cook over moderate heat, turning once or twice, until caramelized, 10 to 12 minutes. In a small saucepan, cook the remaining stick of butter over moderate heat until milk solids brown and butter is fragrant, about 7 minutes (stirring often). In a medium bowl, use an electric mixer to beat the eggs with 1/2 cup sugar- until thick and fluffy (about 3 minutes). Beat in the flour and 1/4 teaspoon salt, then beat in the browned butter, scraping the milk solids into the custard mixture. 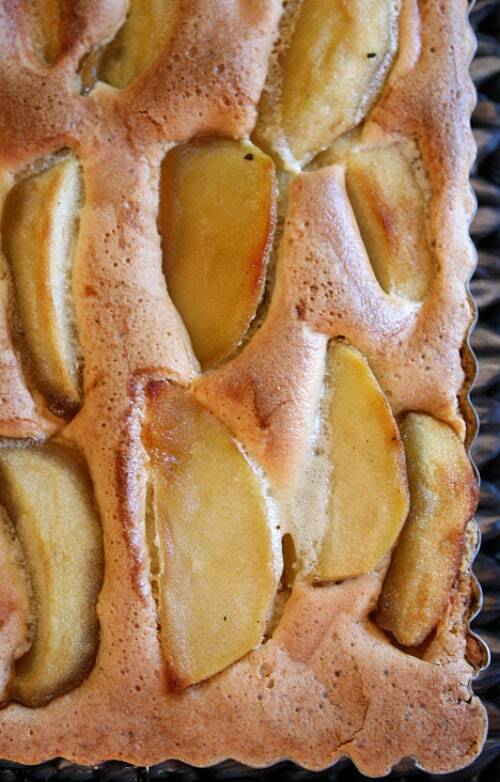 Pour the custard into the shell; arrange apples in a single layer, slightly overlapping in a decorative pattern. Bake in the center of the oven for 35 to 45 minutes, or until custard is puffed and richly browned. Transfer to a rack to cool before serving. 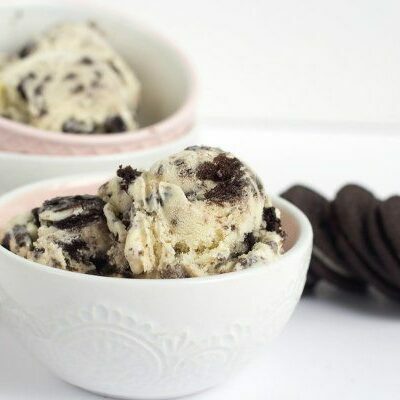 Serve with a dollop of whipped cream or a scoop of vanilla ice cream, if desired. 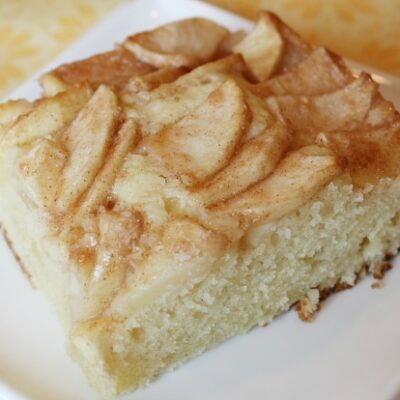 *I found that many of my apples sank into the custard and disappeared from sight, so I saved a few apple slices, then baked the tart for about 15 minutes, then opened the oven and added a few more apple slices along the top (when the custard was beginning to set but still soft)- it worked perfectly. Mmmm This really looks good. I want some!